Arthur Everett Tingley, 830262 was from Midway, Albert Co., New Brunswick and was born June 26, 1896. He was the son of Otis K. and Huldah Tingley, of Midway, Albert County, New Brunswick. He enlisted with the 144th Battalion on December 21, 1915. His occupation was listed as student. He served overseas with 8th Battalion (Manitoba Regiment). He has no known grave and is remembered on the Vimy Monument. He is listed on page 339 of Canada's Book of Remembrance. Roy William Crossman was from Hopewell Cape, New Brunswick and was born December 7, 1894. He was the son of Mr. William D. Crossman. He enlisted with the Royal Canadian Regiment on August 22, 1915. He was first wounded April 4, 1916 with a gunshot wound to the scalp. He was Killed in Action in France at the Battle of the Somme, October 9, 1916. He is remembered on the Vimy Monument and has no known grave. 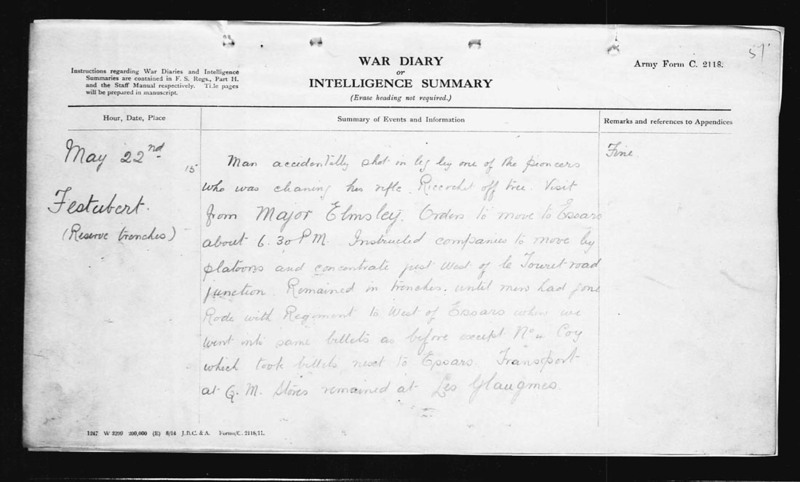 You can view the Royal Canadian Regiment's War Diary Entry for that day here. Donald MacKenzie Moore was from Hopewell, Albert Co., New Brunswick and was born March 19, 1877. He listed his next of kin as C. Archie Moore of Vancouver, BC. He enlisted with the 30th Battalion in Victoria, BC on November 9, 1914. He was listed as Wounded and Missing in Action during the Battle of Festubert in France on May 22, 1915. He has no known grave and is memorialized on the Vimy Monument. 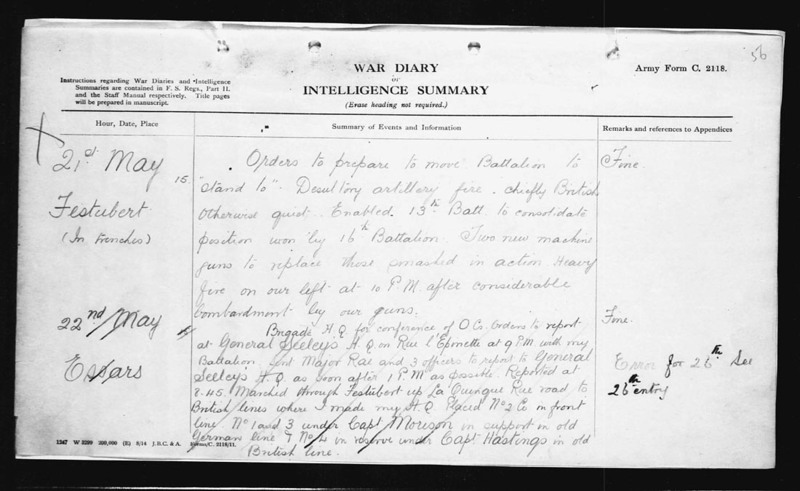 You can view the 16th Battalions War Diary Entry for that day here. And Here. You can learn about the Battle of Festubert Here. 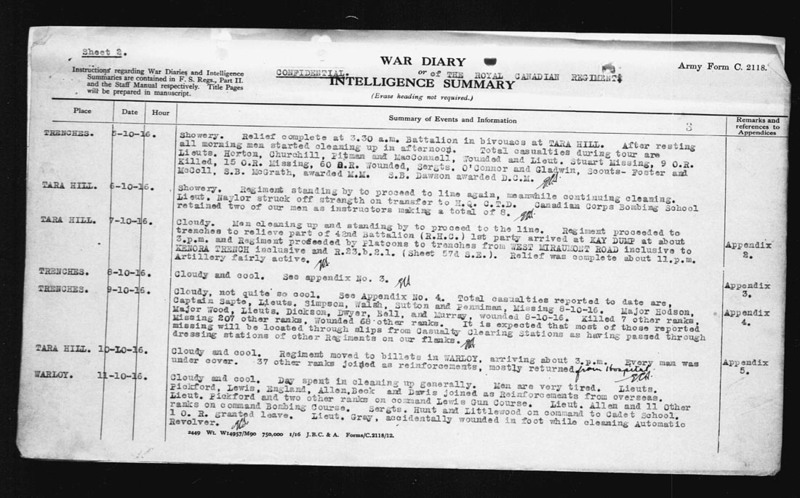 One Hundred years ago today (Dec 20, 2015), Hugh C. Wright from Shepody, Albert County, NB was busy fighting with the 26th New Brunswick battalion in trenches of Belgium. He was only 20 years old at the time. 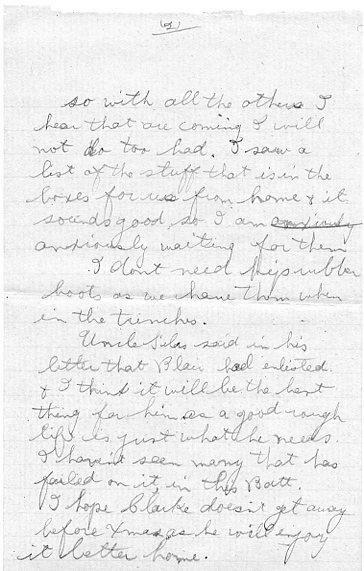 This was one of his letters home and was written December 20, 1915. I received your letter of Dec. 5th to day and was glad to get it. I have got the moccasins and the stuff alright. I had the moccasins on this last time in the trenches and I didn’t have to put on a pair of hip boots all the time we were in as I never was over the tops of these. They are fine. I shall be on the look out for the parcel from Gordon. 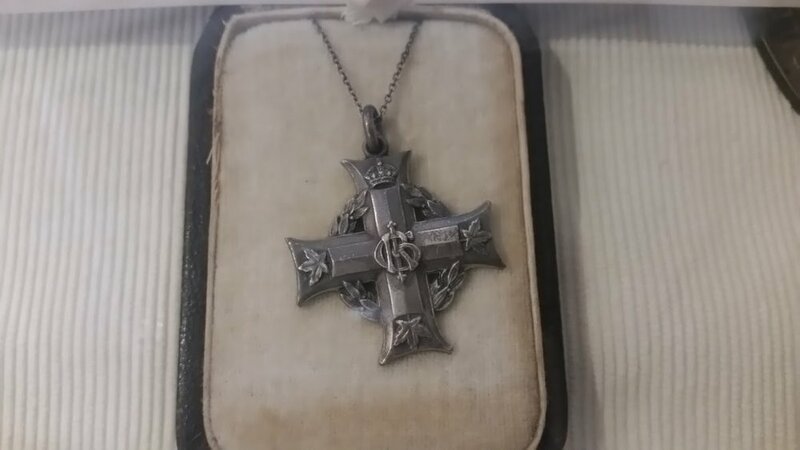 I had a letter from Uncle Silas while we were up in the trenches and he said that Mrs. Cook and he were sending me a large parcel, so with all the others I hear that are coming I will not do too bad. I saw a list of stuff that is in the boxes for us from home and it sounds good so I am anxiously waiting for them. I don’t need hip rubber boots as we have them when in the trenches. Uncle Silas said in his letter that Blair had enlisted and I think it will be the best thing for him as a good rough life is just what he needs. I haven’t seen many that have failed on it in this Batt. I hope Clarke doesn’t get away before Xmas as he will enjoy it better home. Our Company will be in as usual just back of the front line on Xmas Day. We go in there on Xmas Eve (some different place to go on Xmas eve than I had last year), but we will make the best of it wherever we are. I haven’t had a letter from Clarke for some time. I was expecting one from him today but none came. You ought to get my pay alright as I fixed it up with the paymaster some time ago. It would be a nice thing if the three counties could raise a Batt. I must write to Mrs. Carnwarth just as soon as I get time. I sent her a Xmas Card some time ago. I don’t know of anything I can send here for they don’t have anything over here any good. I have some good pieces of aluminum off the nose of shells, but it is hard to send anything like that home. There has been terrible artillery fire for these last two days and it is still at it tonight. 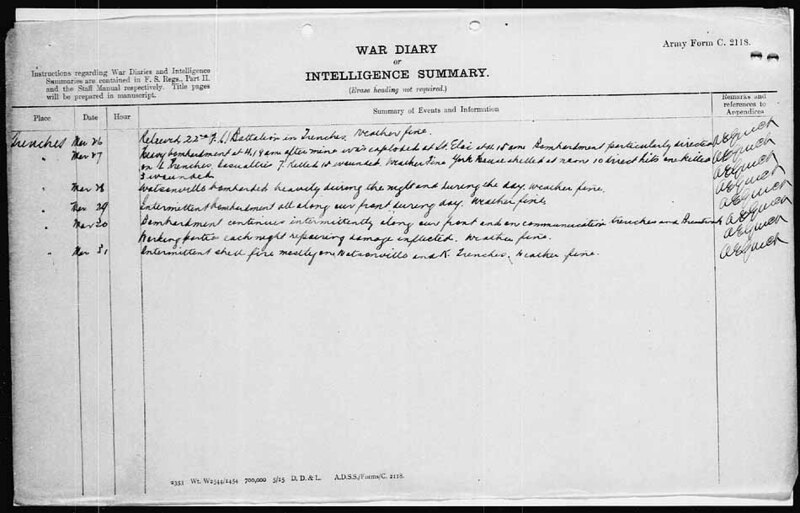 The report is here that the Germans tried the gas but the wind changed and it went back at themselves. I think there is something going to happen pretty soon and the sooner the better and get this thing over as soon as possible. Well, I must close and get ready to go out on fatigue tonight. I just got a nice big parcel from Uncle Silas tonight with some cake, cookies and chocolate. It was a dandy box. Walter Danahy and Stevens were here so I gave them some and will give Silas some in the morning. I received a nice parcel from Aunt Berta last night so I have plenty to eat for a few days anyway. This writing paper is a little tablet that we got in a little book with envelopes in it - a present from the women of Canada. This is all for this time.